Why did one third of U.S manufacturing jobs disappear between 2001 and 2009? And more generally, why did the U.S. industrial base go into decline after 1980? Conventional wisdom has it that job loss was due to competition from low-wage labor overseas, and as such was inevitable. However, by walking into plants in Keene, N.H., my students and I have learned of homemade causes of industrial decline. Part I of this series explained how a locally owned firm, Kingsbury Machine Tool, was undermined by U.S. monetary policy between 1979 and 1984 (D&S, Nov/Dec 2017). Below, I tell the story of Miniature Precision Bearings (MPB), a firm whose competitors lie in high-wage nations such as Denmark, Sweden, Germany, and Japan. If MPB is indicative, the debt-fueled rise of the stock market between the eighties and the year 2000 put the firm into the hands of owners who used the profits to manipulate share price, while sidelining local managers whose focus had been product quality and worker skill. When the asset values of company shares became managers’ priority, workers lost the one asset that meant the most to them: secure jobs that produced a stream of income for twenty years with benefits that made savings unnecessary. Some jobs remain but, without security and benefits, the same positions are a ticket to debt and stress. The shareholder-value revolution turns out to be the economic backstory to the unraveling of rural America. In 1987, Louise Clark and Caterina Hilliker met while working as bearings inspectors in MPB’s white room. Mrs. Hilliker explained, “You put the bearing into the torque machine and you see how many RPMs it does, and there’s a paper that comes out, and it’s like when you do the echogram to your heart, and we do the echogram to the bearing. You have to read what the paper says, pull out if the bearing is no good.” She knew one mistake could cost a pilot his life. Furthermore, the chemicals she worked with in the greasing of bearings were dangerous. One day when Mrs. Hilliker was working in a room where the ventilation was inadequate, her eyes got burned. Mrs. Clark explained her gut feeling that earlier owners would have repaired that ventilation, echoing what the visiting engineer said around 2003 about the factory’s decline. Timken purchased MPB in 1990. Like many producers of U.S. metal products, Timken was founded in the late 19th century by German immigrants. The company made its own steel because vertical integration permitted control over quality. Specializing in tapered roller bearings that went into vehicle wheels gained Timken a reputation for reliability and quality. Why did the prudent Timkens expand in 1990 away from the niche in which they had a secure reputation, and why were they willing to pay Geneen’s high asking price to do so? The answer lies outside the firm, in the go-go financial world of the late eighties and the wild stock market of the nineties. The first sign that U.S. asset prices had lost touch with gravity was not the stock market but rather the wave of highly leveraged buyouts (LBOs) in the 1980s. Geneen bought MPB in 1987 by putting little money down and borrowing at high interest rates more money than the firm was worth from a bank, Donaldson, Lufkin & Jenrette (DLJ). Geneen got the loan from DLJ with the promise to make a big installment payment by June 1990 by growing little MPB into a powerhouse. Why did DLJ lend Geneen so much? First, Geneen had already grown ITT from a company with sales of $700 million into a conglomerate with sales of $22 billion in seventeen years. So when Geneen said that he could grow MPB bigger fast, the claim was credible. Secondly, DLJ was not going to wait for Geneen to pay them back; rather they would sell Geneen’s debt off in the form of junk bonds at 15% interest to third parties. If Geneen failed to make his loan payment in 1990, buyers would see the capital value of their bonds decline. If Geneen did make his first fat installment, everybody holding pieces of his debt would see the asset value of the junk bonds soar. If Geneen made his balloon payment in 1990 successfully, holders of the high-interest bonds which DLJ had issued would appreciate quickly: for example, a $1,000 bond paying $150 per year (15%) might be snapped up by a secondary buyer for $2,000. Why? Investors would no longer demand an interest rate as high as 15%, because the risk of bankruptcy would have declined. The way that bond interest rates come down is for the market to bid up the price of the bond until its coupon (the $150 in this case) divided by that price results in a lower interest rate; for example, $150 coupon divided by a $2,000 bond value would yield 7.5% interest. Geneen flew into sleepy Keene in his private jet, and showered young executives with eye-popping salaries, with the proviso that they grow the firm by 50% in three years. With his loan, Geneen did buy brand new equipment (such as Japanese Seiko CNC machines), he hired new people, and he gave big raises to local executives. His management philosophy was the following: “I wanted the people...to reach for goals that they might think were beyond them...And I wanted them to do it not only for the company and their careers, but also for the fun of it.” To hear the executives of MPB tell it, yes, there was excitement working for Geneen, and one-on-one meetings with him are memorable—but there was also a lot of pressure. Geneen’s philosophy also included the following: “The most difficult task of all is firing a man who is working hard, doing the best he can, but whose confidence in himself outstrips his abilities. He’s in over his head. It breaks your heart to tell such a man he is incompetent. After all...it was you who put him in deep water over his head.” In other words, Geneen placed large speculative bets using other people’s money and portions of the U.S. industrial base. If a bet failed to pay off, Geneen blamed others, and abandoned the company. The black magic of LBOs was that the debt would stay with the company, not with Geneen. The Keene crew did grow the firm by as much as 20% in one year, but Geneen had saddled MPB with debt payments that the firm could not make, so in 1990, MPB was in financial distress despite rapid expansion into profitable markets. He could have renegotiated the loan on easier terms with longer repayment. But neither DLJ nor Geneen wanted that to happen—rather, they wanted the junk bonds to appreciate. A bankruptcy would have had the opposite effect. Geneen had to make the payment if he wanted to ever do business with DLJ again—and he planned to do a lot of debt-financed acquisitions. Geneen knew that Timken wanted MPB badly, because Timken had come in second in the 1987 bidding. A third bid had come from Swedish firm SKF. Geneen intimated to Timken in 1990 that the Europeans were still interested—though in reality the European response to Geneen’s asking price had been, “Are you kidding?” He convinced Timken to pay $185 million for the company in 1990, although Timken valued MPB at only $93 million. With cash from the sale, Geneen made his balloon payment to DLJ. Since the only part of his own money that he had risked was the down payment in 1987, he could net very little and still make a high return. For example, if Geneen (hypothetically) had put down $8 million to purchase MPB, and sold MPB for $4 million more than necessary to repay DLJ, then Geneen would have made a 50% return on equity in three years. By 1990 the profits a firm could produce from products were no longer at the forefront of the mind of the firm’s owner. Rather, what interested Geneen was the increase in the firm’s asset value. Furthermore, the bank was essentially a co-owner of the firm, and what interested DLJ was the increase in the asset value of the firm’s debt! Geneen valued his relationship with his bank more than his relationship with the firm’s managers. As for the workers of the shop floor, Geneen never met them. This change from viewing the stream of profits that a firm produces to looking at the potential to grow the firm’s asset value in a very short period of time was fundamental between 1987 and 2003. 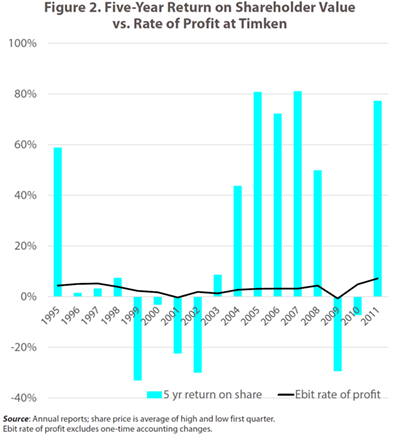 Annual reports reveal that by the nineties, Timken no longer measured success by the old-fashioned rate of profit, but was rather using the five-year return on shareholder value as the measure of success. The distinction between the rate of profit and the rate of return on shareholder value is the key to understanding the decline of MPB in the 1990s. 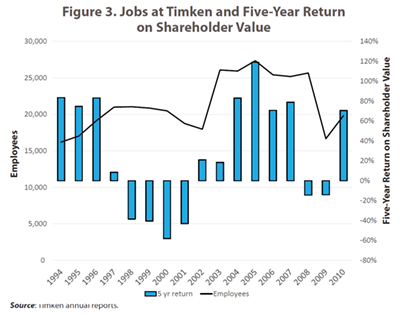 As Figure 2 illustrates with Timken shares, the five-year return on shareholder value is vastly more volatile than the rate of profit. The five-year return on shareholder value answers the question, if someone invests in a share of Timken stock and holds it for five years, how much money will he or she make? There are two sources of gain: dividends and capital gains. The dividend is a portion of company profits paid out to holders of shares. If the company experiences no profits, it has the option to issue no dividend. If dividends are 3% of share price, then someone who invests a million dollars in Timken shares, will receive $30,000 per year in dividend income. Dividends are not the source of big bucks, but, given a large enough investment, they can permit the wealthy to live without working. The stock market gains of the nineties originate with the other factor, capital gains, which are the difference between the share price when the stock is purchased, and price when it is sold five years later. The five-year capital gain is added to the sum of five years of dividends, and then this sum is divided by the initial price paid for the share. The result is the five-year return on the share of stock. An example can make this clear: if somebody purchased a share of Timken stock in 1991 for $24.81, and sold it in 1995 for $34.31, she made a capital gain of $9.50. The share also issued dividends in 1991, 1992, 1993, and 1994 of $1.00 each year, and $1.11 in 1995, for total dividends of $5.11. Her five-year return on a share of Timken stock was ($9.50+$5.11)/24.81, which comes to 59%. She would get back her initial investment of $24.81, and she would make an additional $14.61. If we assume she purchased 100 shares with $2,482, then she not only got her money back but also obtained an additional $1,461, which is a good return for five years. What Is Rate of Profit? Profits are sales less costs of production, commonly known as earnings before interest and taxation (EBIT). To compute the rate of profit, divide EBIT by working capital. Working capital is made up of gross property, plant, and equipment; total current assets; and costs of doing business. Current assets include inventories, and costs of doing business include payroll. According to the 1996 annual report, Timken’s EBIT was $257,257,000. Working capital was $5,096,551,000. The rate of profit was therefore 5%. Remember that prior to 1980, the stock market was flat (see Figure 1), which means that capital gains tended to be negligible. If our investor had received dividends alone, her five-year return would have been only 21%, or about 4% a year. That is why, prior to 1980, firms were content to maximize the rate of profit instead of maximizing shareholder value. MPB was Timken’s first acquisition in the new era, but not the last. In 1993, Timken acquired a Connecticut facility that made bearings for helicopters. In 1994, Timken started making bearings for computer disk drives in Singapore, at the same time that it opened plants in Asheboro, North Carolina and another in Virginia. In 1995, Timken acquired the U.S. firm Rail Bearing Services. In 1996 and 1997, Timken purchased plants in Poland, Romania, Italy, and China. The plant in China would make giant bearings for wind turbines, a product which Asheboro would make for the US market by the early 2000s. By 1998, Timken was also refurbishing rail bearings in Indiana and South Africa. We usually suppose that U.S. corporations purchase plants overseas because the labor is cheaper. Yet Timken’s acquisitions occurred in countries at all levels of the wage scale. The goal was diversification from bearings for auto to bearings for aerospace, rail, helicopter, wind turbines, disk drives, and medical equipment, and to break into markets around the world rather than rely upon the U.S. domestic market. Timken diversified products and markets to cushion gyrations in shareholder value. If the firm produced multiple products for multiple markets, then bad news in any one market wouldn’t harm the stock price much. Yet diversifying caused a growing disconnect between Timken headquarters and production workers at plants around the world. When asked in 2012 why he was building new plants in Asia, Timken CEO Griffith explained: “[Timken bearings] make machines more reliable...Where the applications were the hardest, the dirtiest, and the most-challenging, those were the industrial markets, those were the infrastructure markets. And interestingly, where did the infrastructure get developed in the last decade?” In 2012, the answer to his question was Asia, while in the 1995-2000 period, infrastructure was being developed in Eastern Europe (after the Berlin Wall came down), and in South Africa (apartheid ended in 1990)—precisely where Timken made acquisitions. Timken was buying plants in other nations because the people buying bearings were in those nations. In contrast to the expansion of infrastructure in Eastern Europe and China, U.S. investment in infrastructure declined between 1990 and 2000 from 3% of GDP to 2%. How did Timken’s strategy of reducing new capital investment in favor of acquisitions work out? When Timken purchased MPB in 1990, its share price experienced a 15% capital gain, though the firm experienced a 1% loss on operations. Yet despite diversifying away from U.S. auto, Timken’s five-year return on shareholder value was a 60% loss in 2000 (see Figure 3). Timken had expanded into Asia and Eastern Europe, and the 1997 financial crisis caused GDP to contract in both locations. The setback only increased Timken’s determination to loosen ties to communities in any area of the world so that it could rapidly contract where sales were in decline. With the U.S. recession in 2001, Timken closed a legacy plant in Ohio and expanded in China, Romania, and North Carolina. Figure 3 illustrates that after 2001 layoffs followed the five-year return on shareholder value closely. By 2010, CEO Jim Griffith must have been regarded by his peers as a genius when, despite global recession, the five-year return to Timken shareholders fell only 10% (see Figure 3). The fall in the one-year return was far more drastic, but Timken laid employees off so rapidly that the company’s share price was protected. Mrs. Clark in Keene was one of those laid off in 2007. Though she returned, her employment contract would be with a temp agency. By the late eighties the stock market was taking more money from business than it was providing to business. Firms raise money from the stock market only when they issue new shares. After that first issue, any resale of the shares does not benefit the company, but rather benefits the owners of the shares. Thus most of the capital gains in the stock market did not finance U.S. business activity, but financed instead U.S. households. On a personal level, executives held shares of stock, and workers sometimes held pensions that were invested in shares of company stock. Few people caught on to the fact that the rising stock market of the 1987 to 1999 period might erode incentives to invest in new equipment for the industrial base. To understand how the capital gains in shares could actually curtail new capital spending, it is necessary to understand dividends, stock buybacks, and acquisitions. A “stock option” is a certificate that gives the bearer the right to purchase shares at a specified price, say $20 per share. If the share price never rises to that level, the options are worthless. But if the share price rises higher—for example to $30—then the holder of options can purchase them at the locked-in price of $20 and sell them the next day for $30. Paying executives by stock option permitted them to increase their wealth substantially and rapidly. Once executives were paid by stock option, they devoted attention to managerial actions that would have an immediate effect on share price. Working people were won over to this strategy when their pensions were invested into the company’s stock, as was the case at Timken. By 1985, Timken executives were getting paid in stock options, and this gave them an incentive to spend cash in such a way that share price would rise. In 1992, Robert Mahoney was brought on the board of Timken. He ran Diebold, which made ATM machines. Wall Street loved him because he was laying off workers and distributing dividends. By 1994, Timken’s board included J. Clayburn La Force, retired Dean of UCLA’s business school. He believed that removing the social safety net would make people work harder, and that firms should not be in the business of community philanthropy. The 1994 annual report noted that Timken would now “emphasize initiatives and investment that are more likely to create short-term impact”—code for using cash from operations to make the share price rise. In 1993, the Timken board in Ohio was split, with the old school represented by W.R. Timken, Jr., whose family’s reputation was staked on the quality of the product, and new people such as La Force and Mahoney seeking to divert funds to stock market strategy. The new ideology had not completely taken hold. Timken gave its Keene manager authority to donate significantly, which hit home for me when the company donated one-third of the cost of a new building to Keene State College around 2007—a time when the state began vicious cuts to the college budget. Timken would diversify globally and into different product lines, but the firm did not become a conglomerate (where product lines have nothing in common). The disparate parts of the firm would always have bearings in common, and until 2014, Timken made its own steel, which gave it a quality edge. Vertically integrated firms control quality in a way that other makers cannot. This is the story of how a stock market that lost touch with gravity distorted decision-making at even a staid and philanthropic firm like Timken so that spending decisions were at odds with product quality and workforce morale. In early 1995, W.R. Timken, Sr. died. Joe Toot would retire in 1997. Jim Griffith, with a Stanford MBA, would rise to Chief Operating Officer in 1999, and to CEO in 2002. At Timken between 1991 and 2000, 88% of cash came from existing operations, and 12% from debt (note that no funds were raised from the stock market). These funds financed five activities: acquisitions, dividends, stock buybacks, debt reduction, and new capital spending. That last is the purchase of new equipment to keep up with technological change. Economist William Lazonick was one of the first to notice that firms were diverting money away from investing in new capital equipment toward the stock market, through two channels: higher and more consistent dividends, and the practice of buying back shares of their own stock, which has only been legal since 1983. The share of cash that Timken used to pay out dividends and stock buybacks did increase—whereas placating shareholders absorbed 15% of the cash at the beginning of the decade, this rose to 22% in one year, and settled at 20% by 2000. The dividend remained constant even in years when the firm made little profit or suffered a loss. The logic behind the dividend is that if it is typically a percentage of the share price, one can also conclude that the share price is typically some multiple of the dividend. Hence, if the dividend is held steady during a period of low profits, the value of shares should hold as well. Raising the dividend as a method of raising stock price does not always work, but it is a strategy to which corporate executives have easy access. 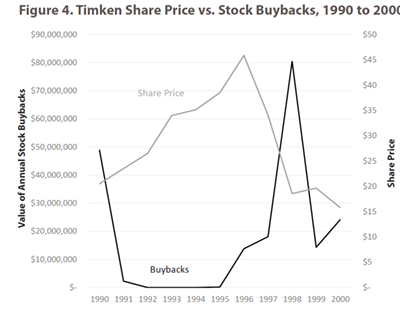 Timken also undertook stock buybacks, including in 1996, 1997, and 1998 (see Figure 4). Timken’s share price was suffering a decline between 1996 and 1998. The company purchased $80 million of its own shares, presumably to reverse that decline. This is similar to a poker player bluffing by betting large amounts of money on her own hand in an attempt to get the other players to assume she has been dealt a good set of cards. Did Timken’s $80 million bluff work? The stock price does not seem to have reversed course by much. In a card game, when a bluff does not work, the one who made it simply loses the money, in this case $80 million that might have been spent on new equipment. However, in the case of a buyback, even if the maneuver doesn’t raise share price directly, simply buying back some shares reduces the number of shares outstanding. A critical measure of success in the age of the stock market is earnings per share (EPS). The firm with low earnings can buy back some shares, and then the denominator of EPS is smaller, so that EPS rises. A rising EPS is a second method to push up stock price. At 7%, acquisitions used more cash than dividends (5%). Furthermore, the trade-off between capital spending and acquisitions is direct: a firm can either invest in in-house capacity to innovate and stay competitive, or the firm can let existing capacity dwindle, and use the funds to purchase other plants that are innovative and competitive. Over the course of the nineties, Timken was choosing more and more to acquire: new capital absorbed 79% of Timken cash 1991 to 1995, but fell to 61% from 1996 to 2000. Acquisitions rose from a negligible share of spending for 1991 to 1995, to 14% between 1996 and 2000. From the perspective of the firm’s profits, whether the management invests in new equipment or acquires another firm (and thereby gets used equipment) is not important. However, for the economy as a whole, if every firm begins to acquire, the industrial base will cease to expand. Acquisition simply transfers ownership, rather than adding productive capacity to the economy as a whole. Furthermore, acquisition often breaks down the human ties that are the yeast of innovation. Finally, the price paid for an acquisition may well be higher than fair market value. Timken paid twice as much as MPB was worth, according to Timken’s own calculations. How did Timken’s acquisition of MPB affect the human ties that had won the little plant a reputation for offering attractive employment and producing a product reliable and precise enough to be incorporated into the Hubble Telescope? People connected with industry in Keene make a distinction between managers who live in a community and know the shop floor, versus managers who live in another state or never walk into the plant. For executives who live in a community, the purpose of the plant is to provide them with a decent income and reputation in the location where they reside, while also keeping that location pleasant (hence donations to the local medical center or theater). Positive relations with the shop floor mean that when the executives walk down Main Street, the community says, “Look, there goes so and so. He runs the place.” Making a quality product is also a source of public satisfaction—that MPB made components of the Mars Rover is part of local lore. It is easy to discount this community pressure and pride, yet it is an important part of the social fabric that makes small towns thrive, and is a reason that acquisition of independent firms by larger corporations tends to lead plants in small towns into gradual decline. Recall from Part 1 of this series that the original family owners of Kingsbury were determined not to sell to a conglomerate, and promised the outsider they did hire an ownership stake if he settled in Keene. Timken’s 1992 annual report features CEO Joe Toot on the shop floor in Canton, Ohio. It was precisely that kind of familiarity with the production process and the people doing it that was dissipated with the strategy of global acquisitions. Toot had managed the company for decades, and it seems likely that acquiring MPB in 1990 did not change his view on how to do business, but his method of control might not work well with diversification. He was old school in his negative views of unions and women in leadership, but he and the Timkens were also old school in that solid employee benefits and donations to local schools and hospitals had cemented their place in Canton, Ohio. That reputation is why Keene had been relieved when MPB passed from Geneen to Timken in 1990. One man that Louise Clark trusted was Tom Uhlig, the president of MPB in 1990. Uhlig was determined to make the transition from Geneen to Timken work. Timken’s reputation in 1990 rested on the decision to build a state-of-the-art steel plant in Ohio in 1982, in the depths of recession. That showed prudent focus on quality for the long-term—and the use of Japanese methods at the steel plant was evidence of intelligence. To a man like Uhlig, Timken seemed a lot better basis for MPB’s future than Harold Geneen’s debt-fueled dreams. Uhlig was aware of something that may have eluded Timken executives in Ohio. MPB had relied heavily on military sales, especially during the Reagan years. With the end of the Cold War in 1989, that market shrank severely. Worse yet: GPS technology was about to make miniature bearings in guidance systems obsolete. It would no longer be the case that every dial on a pilot’s instrument panel would have miniature bearings behind it. Instead, the aerospace instruments were about to switch from mechanics to solid-state technology. 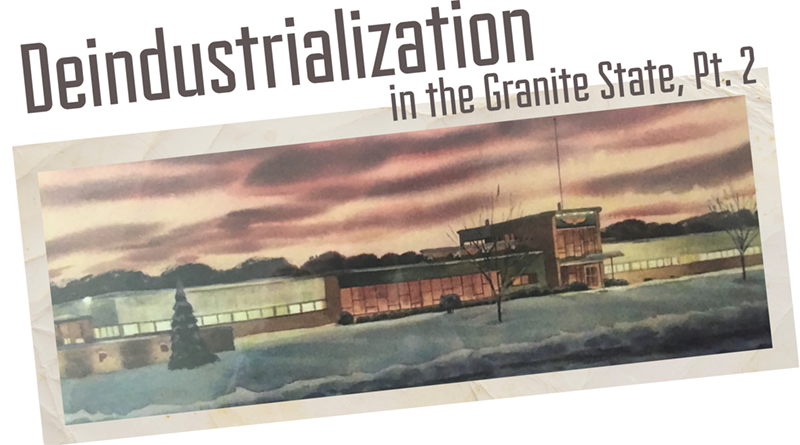 When Keene’s miniature bearing plant faced obsolescence from the technological change of the early nineties, people who had the motivation and capacity to adapt the plant included Uhlig and chief engineer Don Leroy. They had spent decades of their lives at MPB, directing where Geneen should invest his cash and also protecting the shop floor from the extreme pressure Geneen was putting on the executives. No need to tell everyone that the plant could go bankrupt from the weight of all that debt, for example. After all, people in 1987 had plenty of other local employment opportunities in precision metal work, and good machinists and bearing inspectors did not grow on trees. In short, the local executives viewed it as their job to protect the plant’s productive capacity, and to make sure that it contributed to a decent quality of life in the community in which they lived. Of Uhlig, Mrs. Clark explained, “He’d be right in the shipping room helping us out. No matter where there was a need for help, he didn’t mind getting dirty.” And her husband added, “I mean, this plant ran three shifts. There was times he would come in on the third shift at two in the morning.” As manager of a business, Uhlig controlled costs and invested in new equipment, but most importantly between 1989 and 1992, he developed new product lines. It turned out that rising health care costs had a positive side: increasing demand for miniature bearings in CT scans and dental drills. The Keene-based sales force identified opportunities, and engineers at the Keene research lab developed new products. The strong human ties between Uhlig, Leroy, the salesforce, the machinists, and the bearings inspectors were critical in making such a dramatic shift. Louise Clark inspected bearings through her microscope in the white room, she felt keenly the change in ownership. With the advent of Timken’s control, she started to notice the change in management philosophy that was rippling through board rooms, executive suites, and shop floors throughout the United States between 1987 and 2003. “All of a sudden they are making us push, push, push,” she says, with a gradual dawning that “we were never in the red, they just wanted more out of us, but for less.” This was a change from her experience at New Hampshire factories between 1974 and 1989: “The companies really cared for the employees, especially if you were a good employee...I mean, we had 100% Blue Cross and Blue Shield, my two boys cost nothing. But as I was working at Timken, every year from 1989 we’d have a corporate meeting in the cafeteria, and it was the same old, same old: we went from 90/10, 80/20, and then before I left [in 2009] it was 60/40. And then you see the premiums of what we have to pay!” Union organizers met with workers off site. Though nothing came of it, even to consider a union was a dramatic step for Keene people. In national economic news, wages take center stage more than benefits, and yet when the people who worked at MPB recounted their story, they said it was the loss of benefits that hurt them the most. Benefits were one reason that Mrs. Clark and her husband Reggie (a machinist at MPB) had been attracted to industrial employment in the first place. Mr. Clark recounted: “Back in the fifties and sixties ... I remember my father and my uncle that owned the farm. We didn’t have any insurance, we didn’t have any holidays. We didn’t have any vacation. So when companies like MPB opened, they brought along benefits. I can remember talking to these guys who said, “Oh my God, I only got a week’s vacation.” I said, “Hey, listen—I been living on the farm, we didn’t even know what a vacation was. Our vacation was, one day you went to Hampton Beach, and then you came back home. That was your vacation!” The powerful magnet of a job with benefits pulled him off the farm into the life of a machinist at Sanders Associates in Nashua (now BAE Systems). At Sanders, he met Louise working on sonar and radar for submarines. In 1974, they moved back to 156 acres of hardscrabble farm in Alstead, but their source of income would remain industrial employment down in the valley of Keene. Many of Keene’s working people live in Alstead. Land is beautiful and cheap, but services are minimal so a work ethic is essential. The dirt roads are ice in February and mud in April. For Mrs. Hilliker, too, benefits had always been the main attraction of the job at MPB. Mrs. Hilliker had emigrated from Italy to Keene, where she worked as a seamstress from her home. However, in 1987 she was recently widowed, and sought health insurance for herself and her four children. Her fine motor skills were transferable to the tasks of bearing assembly and inspection. At MPB, the health benefits were supplemented by a retirement nest egg. Furthermore, by working the 7am to 3pm shift, Mrs. Hilliker could be home for dinner with her children. The pay was low, as it usually is for women in the workforce. Former employees told me that the pay was equivalent to $27,000 in today’s dollars, so it was really job security and benefits that made the position attractive. The retirement and health benefits in 1987 were good enough to free a mother of four from the need to save money for the catastrophic events most likely to occur: ill-health and old-age. Finally, the job offered a one-week bonus twice a year; this permitted her family to spend a week by a lake every summer, and also provided her with the cash for her children’s Christmas gifts. This last was brought home to me recently when a neighbor explained that she and her husband had just returned from their first one-week family vacation in ten years, only to find themselves without the means to purchase groceries or pay utilities. She and her spouse had no paid vacation, much less a bonus. This comparison reminds us that the wage rate per se is only one factor in compensation, and opens up windows onto the stressors of contemporary rural American life. An example of how pro-shareholder thinking affected the way firms handled rising health care costs is illustrated by Financial Accounting Standards Board Ruling No. 106. FASB 106 mandated that employers set aside more funds for retiree health care costs, given the aging population and rising health costs. FASB 106 went into effect in 1993, and required Timken to set aside $254 million dollars immediately. It was already a very bad year for Timken, which anticipated a 0.43% loss. The FASB 106 set-aside pushed Timken’s 1993 loss from close to zero to -7%. The company responded by cutting health care benefits, including retiree benefits. Part of the rise in employee share of health care costs was because the advent of computer technology by 1990 had created diagnostic tools such as CT scans and MRIs which were highly useful, but also expensive. Mr. Rooney negotiated benefits for the Keene facility until he retired in 2003, and he says with rising costs, it just wasn’t feasible for the company to cover 100% anymore. His new goal became 80%, and he held onto that until in 2003. One reason he retired early was that Timken planned on removing the ability of Keene-based executives to negotiate benefits contracts for the local plant. Indeed, the 60/40 split that so outraged Mrs. Clark emerged after Rooney left. Of course, Timken was not the only company affected by FASB 106, and many employers responded to the increased requirements to set aside funds by reducing health care benefits. The business press reported that the stock market was pleased by the reductions in benefits. Despite the 7% loss, Timken’s stock price rose between 1993 and 1994. The success the Keene crew had at adapting miniature bearings to new markets won Uhlig promotion to oversee Timken manufacturing for all of North and South America—from Ohio! Leaving his home in New England was the last thing that Uhlig wanted to do. In Ohio he found that Timken’s management wanted him to focus solely on cutting costs by 1992; he had little room to bring in new equipment or to develop new product lines. We saw how capital purchases declined from 79% of Timken’s spending 1991 to 1995, to 60% for 1996 to 2000. The instructions Uhlig received as manager of production at Timken plants in the Americas provides insight into how that change was implemented. Timken pitted each production facility against the others in competition for the annual capital expenditure budget. Only those plants that could demonstrate that they expected a return of more than 8% on the capital invested received new equipment. Another Keene-based executive believed Geneen had purchased more new equipment for Keene’s plant between 1987 and 1990 than Timken did in the next fifteen years. Though Uhlig’s new title and the relocation to corporate headquarters both implied that the promotion gave him authority, he had held greater room to maneuver when he ran the miniature bearing plant in Keene because there he had both a salesforce and an engineering staff to help him adapt to markets. He didn’t want to simply cut costs, so he quit within a year. Uhlig came back to MPB in 1998 in a slot reporting to the plant manager, and Mrs. Clark was hopeful that he would bring back the old ethos, but he resigned in 2001. In 2003, a local inventor was in negotiations to sell the plant new diamond-tipped grinding machines. Instead, Timken diverted resources to the acquisition of Torrington Bearings in Connecticut. The giant merger captured the stock market’s attention, and loaded the company with debt, which is perhaps why Timken sold half of the facilities acquired to a European competitor only four years later. Back in Keene in 2003, Timken cut costs by removing the sales force, and relocating the engineers to headquarters in Ohio. The idea was to save money, and yet corporate headquarters charged Keene’s facility $5 million dollars a year for their share of Canton’s facility, so it really would have been in the Keene facility’s best interest to keep the engineers in New Hampshire. Another person who left was machinist Reggie Clark. Where he had once supervised 26 people, there were by 2003 only three, because most of the machining had been outsourced to local shops. So the company proposed cutting his pay. Such vertical disintegration means product quality is not as high a priority as cutting costs. In a surprisingly bright turn of events, Mr. Clark was recruited by a precision lens manufacturer down the street where he was considerably happier for his last decade of employment. Today Timken’s Keene plant employs fewer than 200 people, and production of bearings for x-ray tubes was snapped up by a regional competitor. The implication from this analysis of Timken and MPB is that acquisitions by outside owners who have an eye on shareholder value reduce the role of staff who have the commitment and ability to adapt plants to changing market conditions. This could explain why firms that had survived for seventy or eighty years suddenly went into decline at the end of the 20th century. The spectacular rise of the stock market between 1987 and 2000 gave influence to the kind of management that did not promote the health of the industrial base. Figure 5 illustrates the near-inverse relationship that developed between the stock market and capital investments at bearing plants nationwide between 1987 and 2009. The rising stock market coupled with stock options and buybacks created incentives for a company such as Timken to acquire multiple plants making related products for multiple markets. This diverted attention from the human relationships and technology that created quality product and innovation at any one plant. Diversification gave executives the power to reallocate resources to avoid those terrifying drops in shareholder value—but it also put distance between top executives and local management where production took place. Instead of finding a way to keep a plant going, executives in a distant location who had never met the shop floor or the engineers have an incentive to simply let that plant go into decline. If wealth is tied to share price, executivs are rewarded for abandoning communities in order to make capital gains. In contrast, executives and managers whose own place in the world is tied to the community—people motivated to dig in and find a path forward—get sidelined from authority. Whose job is it to stabilize the stock market to prevent bubbles that funnel funds out of the industrial base? The rate of interest set by the U.S. Federal Reserve and the stock market are inversely correlated, as Figure 6 shows. Making stock buybacks legal in 1983 may be one reason that the stock market began to rise beyond its historical range. The repair for that is obvious. Alan Greenspan came into office in 1987, just as the stock market lost touch with gravity. A more systemic cause of the stock market bubble 1987 to 1999 may be the steady influx of wealth into the U.S. financial markets as restrictions on international financial flows were lifted. It was Greenspan’s job to manage that inflow. Yet in 2002 his successor Ben Bernanke stated, “The Fed cannot reliably identify bubbles in asset prices ... 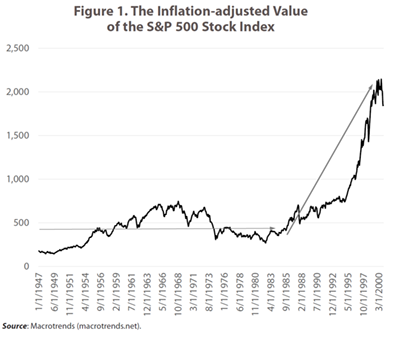 Even if it could identify bubbles, monetary policy is far too blunt a tool for effective use against them.” My introductory macroeconomics class identified a bubble in the stock market two weeks ago, and then the S&P 500 slid 6%. Identifying bubbles is not rocket science. A larger problem is that controlling bubbles means raising interest rates preemptively. Most heterodox economists argue that the Fed’s job is to keep interest rates low to promote investment in equipment that creates jobs. However, if rising asset markets pull money out of the production process, and if low interest rates promote rising asset markets, then this conclusion requires modification. Economist Thomas Palley suggested in 2005 that the Fed could require more collateral for the types of loans used to invest in certain assets—a second way the Fed could reduce asset bubbles that would not rely upon the “blunt instrument” of interest rates. There will be many who do not want to imagine that a stock market bubble can do harm to the real economy. However, the rate at which America’s social fabric is tearing is too rapid for putting our heads in the sand. At least that’s the view from Keene, New Hampshire. SOURCES: Brian Alexander, Glass House: The 1% Economy and the Shattering of the All-American Town (St. Martin’s Press, 2017); German Gutierrez and Thomas Philippon, “Investment-less Growth: An Empirical Investigation,” Brookings Papers for Economic Activity (2017); Thomas Palley, “The Questionable Legacy of Allan Greenspan,” Challenge (2005); William Lazonick Sustainable Prosperity in the New Economy? (Upjohn Institute, 2009);Rana Foroohar The Rise of Finance and the Fall of American Business (Crown Publishing, 2016); Jane D’Arista and Korkut Erturk, “The Monetary Explanation of the Crisis and the Ongoing Threat to the Global Economy,” Challenge (2010). NOTE: Part III of this series will explain how a cluster of small high-tech precision machine tool makers keep Keene at the cutting age of global productivity.